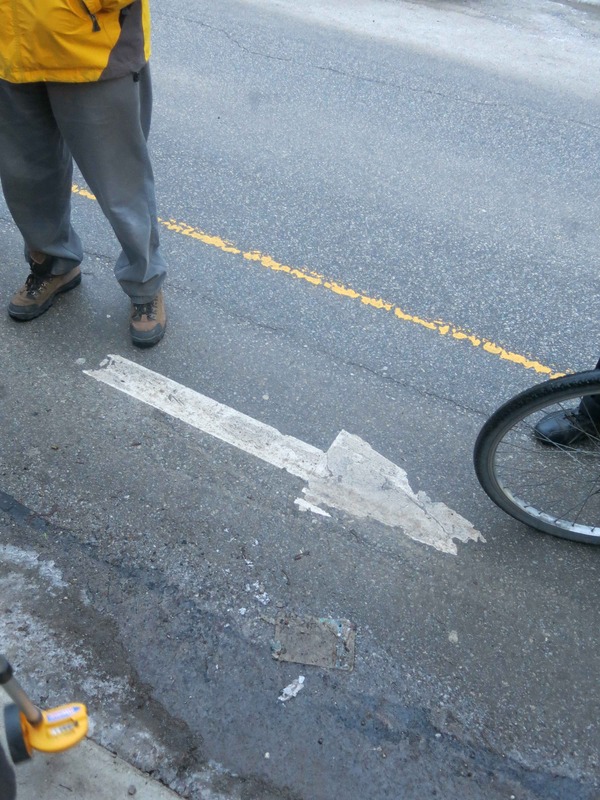 Have you ever biked the wrong way up Shaw? I have (and it took me a while to find an east-west route north of Bloor and south of Dupont that enabled me to avoid doing so). Signed route 16 runs along Barton west to Shaw, and continues south on Shaw to Harbord -- which is great if you are heading south, but not so great if you are heading north towards Dupont. Shaw runs from Davenport through the Christie Pitts neighbourhood, across Harbord, down to Trinity Bellwoods and finally, to Duoro by the tracks, and is already a popular street for cyclists. Unfortunately, its one-way south portions break it up and make it a tricky route to follow while following the law. 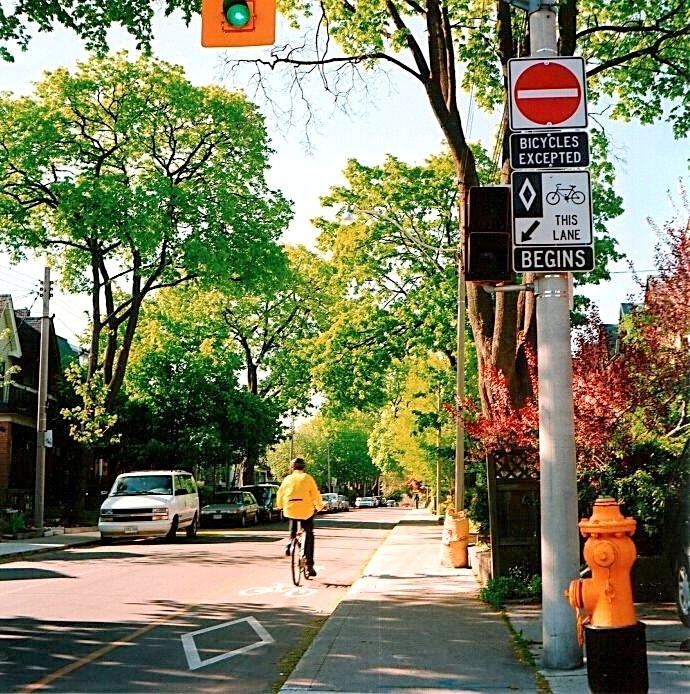 Toronto’s West End Bikeways project aims to address this issue by improving connectivity along three routes: The Shaw Street Bikeway, The High Park-Harbord Bikeway and the Florence-Argyle Bikeway. In 2009 the City approved 11 new contraflow lanes, the plans of which were unfortunately held up due to a dispute over interpretations of the Highway Traffic Act, which has since been clarified by the Ontario Ministry of Transportation (OMT). Contraflow lanes are already a reality on Montrose, south of Bloor. 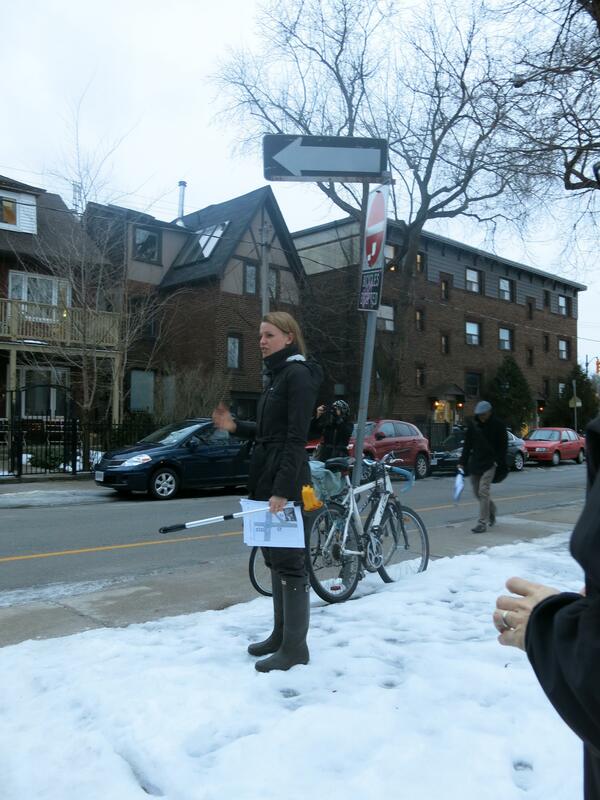 Tuesday’s open house and public consultation on the planned Shaw contraflow lanes, bike lanes and sharrows on Shaw began with a walking discussion/tour between Bloor and Harbord on Montrose, led by City of Toronto planner Christina Bouchard. Bouchard was looking for feedback from the group about how to clarify the markings on the road: would a diamond, a bicycle symbol and a directional arrow in the new contraflow lane suffice, or would it be helpful to also write the word ONLY under the bike symbol, to emphasize the point? The groups reaction to the planned contraflow lane on Shaw was overwhelmingly positive, though one person asked, why is there a contraflow lane being planned so close to a pre-existing one? Bouchard said that Shaw is a good connecting street. 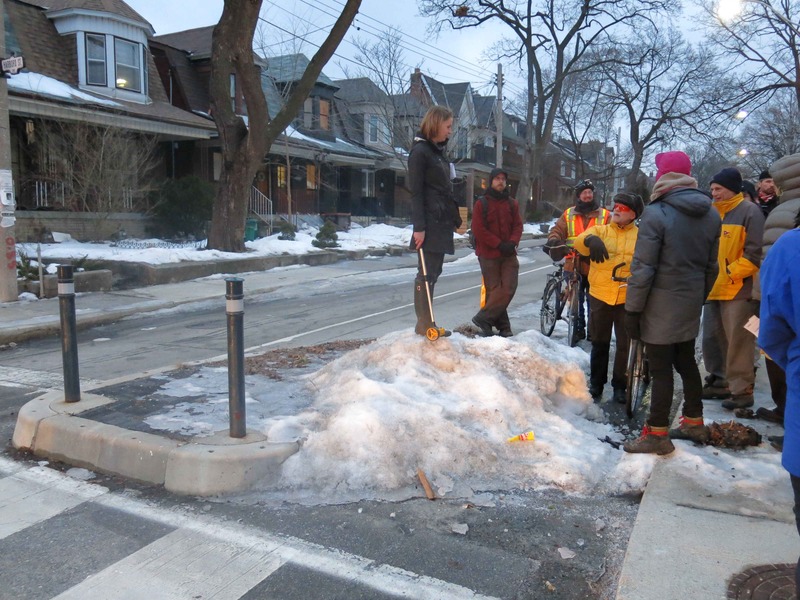 At Harbord the group had a laugh because obviously the Transportation Services department have done a less than stellar job clearing snow near the traffic-calming median, forcing cyclists to bike over snow, dismount, or ride into the oncoming traffic lane. A discussion of the pros and cons of such medians followed. Back at the Bob Abate Community Centre Gymnasium, participants studied the plans, maps and diagrams, and spoke with City staff and local politicians about their concerns. Councillor Mike Layton was there, as well as Cycling Infrastructure and Programs manager Daniel Egan. One concern raised regarding the proposed plans, is where to put parking on Shaw between Bloor and Dupont – currently, parking is planned for the east side of the street, so the contraflow lane would be positioned between southbound traffic on the left and parked cars on the right (from Dundas West to Bloor parking is planned on the west side of the street). 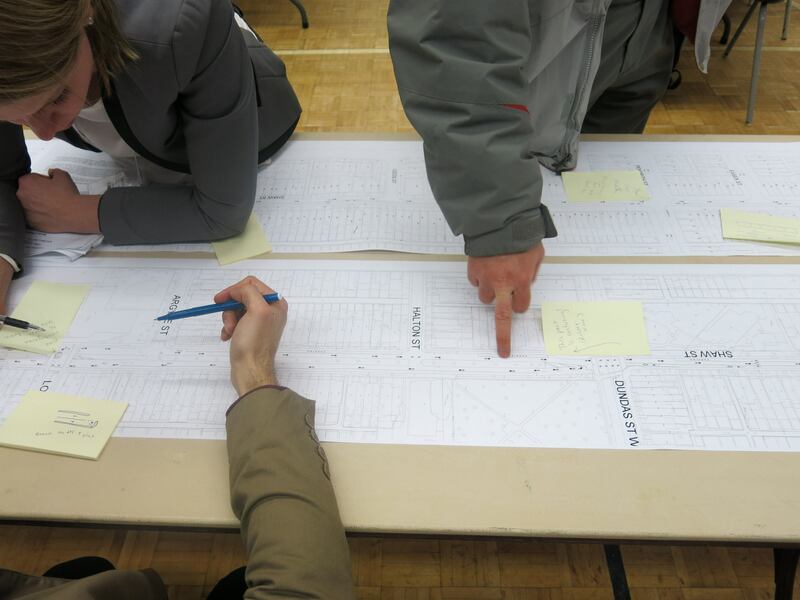 The consultation enabled the public to write out detailed commentary, suggestions and concerns on sticky notes and place the notes right on the plans – a great idea that has been used in past community consultations. The plans also offered a closer look at the intersections, connections and stretches of Shaw that people use. 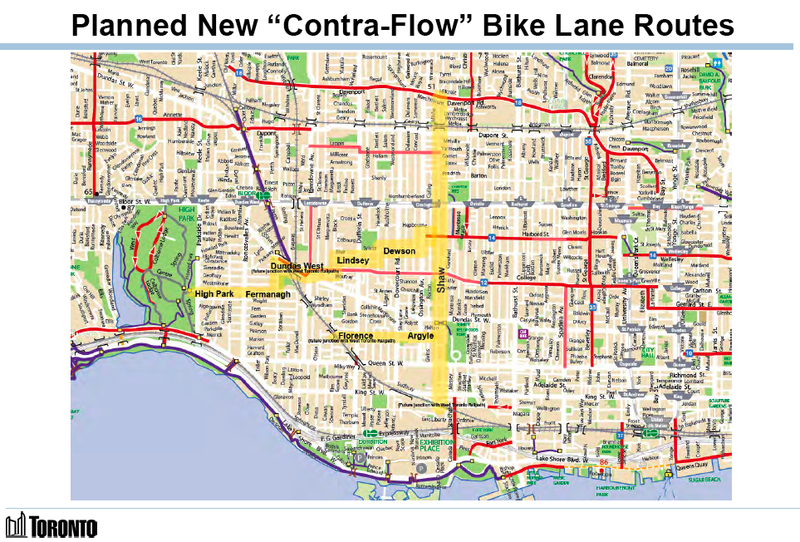 Mark Sherman, for example, explained his idea about how to connect Argyle and Lobb with Shaw (Argyle is another proposed contraflow lane, as part of the Florence-Shaw Bikeway). Sherman’s idea was to make left turns safer by transforming the median at that intersection into a left-turning bicycle lane; Bouchard mentioned the possibility of installing a bike box there for left turns. Shaw Street Phase 1 and Phase 2 (Duoro to Harbord and Barton to Davenport) have been approved and are in the design stage; Shaw Street Phase 3 (Harbord to Barton) is still waiting for approval. City staff haven’t announced a timeline yet, but at the end of the consultation, Daniel Egan suggested that they are expecting the lanes to start going in this year. The idea of a system of bike lanes all the way down Shaw is exciting – it will be especially exciting if and when the Railpath extends to Duoro and connects with Shaw. Shaw may also be the place where the City test drives bicycle-only traffic signals; the City is also looking into installing buttons for cyclists to activate the signals as back up when the sensor loop fails to be activated by bikes. The City is inviting more feedback from the public while they work out design details. To view the presentation panels, get more information, or download a comment form, see the City’s website here. A few steps closer to being able to cycle from downtown to Etobicoke with less threat of death, I like this.